A single genus and two species are recognized in this family. 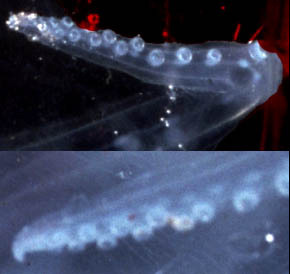 This transparent, gelatinous and nearly colourless octopod is small (90 mm ML, Nesis, 1982/7) and has the body foreshortened in the anterior-posterior axis. The arms bear one row of suckers proximally but two rows near the arm tips; the web is deep. The mantle is fused to the posterior end of the funnel leaving three openings into the mantle cavity. One is the funnel orifice and the other two are the remnants of the mantle aperature located lateral to the funnel. The eyes are in a dorsal position, tubular in shape and with their bases in contact; however, the optical axes diverge by 70° (see photographs below). This is the only octopod known to have tubular eyes. The stomach is reported to be anterior to the digestive gland but actually lies on the dorsal surface of the gland. The third right arm is hectocotylized (see title photographs). Young Amphitretus probably occur mostly in upper mesopelagic depths during the day, judging by their morphology and a few captures (but note depth of title photographs). 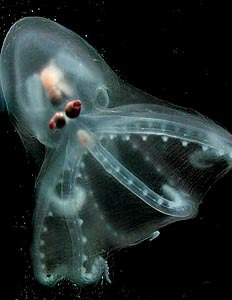 Little is known of the life history and biology of this unusual octopod. Figure.A. pelagicus photographed in ship-board aquaria off Hawaii. Left - Dorsal view of the same octopod as in the title photographs. Photograph by Steven Haddock. Center - Dorsoposterior view. Right - Side view. In latter two images, the octopod is crawling on the side of the aquarium (from Young et al., 1999). with funnel fused ventrally to mantle. Arm suckers in single series proximally, double series distally (see below). Right arm III of male hectoctoylized. Funnel fused to mantle ventrally; mantle opening reduced to broad pores lateral to funnel. Figure. Side view of an A. pelagicus emphasizing the funnel-mantle fusion and the mantle opening just ventral to the eye. Drawing by R. Young. Stomach lies dorsal to digestive gland. Figure. Radula of A pelagicus showing rhachidian tooth (on right) and multicuspid first and second lateral teeth. Drawing modified from Thore, 1949. 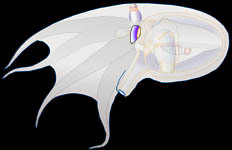 More information on the anatomy/behavior of A. pelagicus can be found here. The arm suckers are more closely spaced near the arm tips and appear to be arranged in two series. Figure. Two views of the arm tips of a living A. pelagicus in a shipboard aquarium with suckers apparently in a double series. Photographs by R. Young. Idioctopus gracilipes Taki, 1962 is probably a synonym (see Hochberg, et al., 1992). A list of all nominal genera and species in the Amphitretinae can be found here. The list includes the current status and type species of all genera, and the current status, type repository and type locality of all species and all pertinent references. The only illustration of a young A. pelagicus is the following drawing from Allan (1945, via Hochberg et al., 1992). Figure. A. pelagicus, 4 mm ML. Left - Ventral view. Right - Dorsal view. The family was thought to have only a single species until O'Shea (1999) demonstrated that two species occurred off New Zealand, although Nesis (1982/87) recognized two subspecies. The species are separated most clearly by the structure of the hectocotylus: In A. pelagicus the ligula lacks suckers but has two series of papillae and the sucker count is 27-28. In A. thielei the ligula lacks both suckers and papillae, and the sucker count is 21-24. In addition, A. pelagicus has 10 lamellae in the outer demibranch of the gill and non-hectocotylized arms that each bear 22-32 (generally below 30) suckers, while A. thielei has 8 outer gill lamellae and non-hectocotylized arms with 24-41 (generally above 30) suckers. Figure. Left - Distal portions of the hectocotyli of A. pelagicus. Right - Distal portion of the hectocotylus of A. thielei. Drawings from O'Shea, 1999. The distribution of A. pelagicus probably includes the tropical and subtropical waters of the world's oceans. Off New Zealand, A. pelagicus is found in subtropical waters while A. thielei is found further south in temperate waters (O'Shea, 1999). Hochberg, F. G., M. Nixon and R. B. Toll. 1992. Order Octopoda Leach, 1818. In: Sweeney, M. J., C. F. E. Roper, K. M. Mangold, M. R. Clarke and S. v. Boletzky (eds.) "Larval" and juvenile cephalopods: A manual for their identification. Smithson. Contr. Zool., 513:1-282. O'Shea, Steve. 1999. The Marine Fauna of New Zealand: Octopoda (Mollusca: Cephalopoda). NIWA Biodiversity Memoir 112: 280pp. Thore, S. 1949. Investigations on the "Dana" Octopoda. Dana-Report No. 33, 85pp. 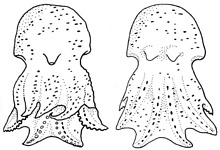 Voight, J. R. 1997 -- Cladistic analysis of the octopods based on anatomical characters. J. Moll. Stud., 63: 311-325. Young, R. E., M. Vecchione and D. Donovan. 1999. The evolution of coleoid cephalopods and their present biodiversity and ecology. South African Jour. Mar. Sci. 20: 393-420. 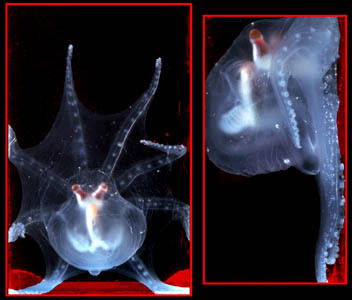 In situ photographs of a male A. pelagicus taken at a depth of 830 m. Left - Orientation of octopod when first seen by the ROV (eyes directed upward, arms curled inward). Middle - Side view with arms extended. Right - Oral view with arms extended. Note hectocotylized right arm III. Page: Tree of Life Amphitretinae Hoyle 1885. Amphitretus Hoyle, 1885. Authored by Richard E. Young, Katharina M. Mangold (1922-2003), and Michael Vecchione. The TEXT of this page is licensed under the Creative Commons Attribution-NonCommercial License - Version 3.0. Note that images and other media featured on this page are each governed by their own license, and they may or may not be available for reuse. Click on an image or a media link to access the media data window, which provides the relevant licensing information. For the general terms and conditions of ToL material reuse and redistribution, please see the Tree of Life Copyright Policies.